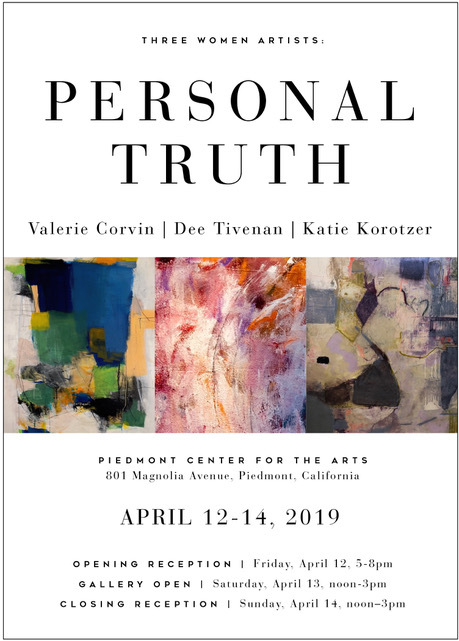 Three Bay Area Women Artists will present an abstract art show entitled “Personal Truth” at the Piedmont Center for the Arts on April 12, 13 and 14. The artists, Katie Korotzer of Orinda, Dee Tivenan of Orinda and Valerie Corvin of Piedmont, each explore color, texture, line and shape in their personal style of non-representational abstract art. The show will be on view Friday, April 12 from 5-8 pm, Saturday, April 13, 12 noon to 3 pm, Sunday, April 14, 12 noon – 3pm. An opening reception is planned for Friday evening, April 12 and a closing reception will have an added display of floral arrangements inspired by the art like the famous annual Bouquets to Art show.